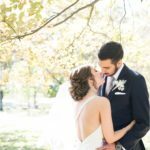 For their fall engagement session, it was everything an engagement session should be; fun, comfortable, and loving. I watched Katie’s face light up as she’d glance at Kameron. Kameron’s smiles to Katie were endearing and loving, even in her Katie moments (see photo of Katie dancing 😉 ) . Their support for one another is encouraging, and their love is true. Their September wedding day at Gardens at Ray Eden, will certainly be even more so, as they seal it with a kiss.